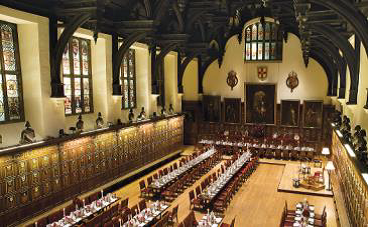 Guided tour of Middle Temple and lunch in Middle Temple Hall. W e will leave Letchworth station to arrive in Middle Temple by 11.30am. There will be a one-hour guided tour which will end in Middle Temple Hall with its magnificent double-hammer beam roof completed in 1573. Generations of royalty have dined on the 29ft oak High Table – reputedly a gift from Elizabeth I. Sir Walter Raleigh and Sir Francis Drake dined in the Hall. It is also said that the first-recorded performance of Twelfth Night took place in Hall in 1602. The tour costs £8 and lunch £30. The limited choice menu will be chosen by the chef at least one week in advance and is, save for special diets, the same for all guests. Bottled water is included in the price and a bar is available for purchases of soft drinks, wine and beer. For further information go to www.middletemple.org.uk/venue-hire/lunch-in-hall. We will return on an off-peak train from London. Numbers are limited to 30; lunch and tour must be paid for 3 weeks before the trip, preferably by bank transfer to LALG, or by cheque to the Tourist Information Centre. Transport costs are extra. Full details for the event will be sent to those who sign up. Please email the group contact (preferred) if you would like to go or leave your name and contact details at the Tourist Information Centre on Station Road.